I am providing a form to use on an Ipad, and would like the user to be able to take a photo and attach it at the time of completion. Is this possible? I apologize but I don't think this can be made possible with Jotform. I figured it would take a special kind of software integration to make this possible, and I'm not sure if our developers would be keen on implementing such a very advanced feature. The most convenient workaround I suggest is to just insert a file upload field in your form. Perhaps the iPad user can take a picture using the iPad's cam and just attach the file using the file upload button. 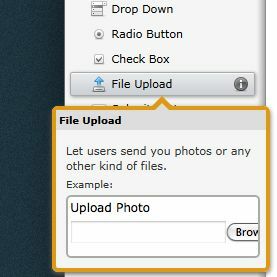 The file upload field can be found under the Form Tools section. It works pretty well with devices such as mobile phones and tablets. I am sure your users wouldn't have a problem attaching photo files in your forms. If you have further questions regarding this topic, please let us know. We look forward to your response. Thank you. I'm also looking for the file upload function to work on an Ipad. It appears as a greyed out button on the Safari browser and Skyfire browser. The button works fine on my desktop browsers, but it's a mystery why you can't attach a file when using an Ipad. Perhaps it's time Jotform purchased a few for your developers to work with. You can try embedding your form in an iFrame then view the form using Atomic Web Browser. See if it helps. We will appreciate any updates from you. Thank you. Unfortunately, much as we'd like to assist you further, only the guys over at Apple can solve this inherent issue. Our apologies still for the inconvenience. Please let us know if you need further assistance! It looks like none of us support team members have an iPad. Sorry for that. What my colleague, Albert, gave you is a suggestion, not a concrete solution. Key words are "try" and "see if it helps". Also, Allan provided links to forums in which it is established that the iPad does not allow file uploading on websites. I conclude that this is the most definite answer so far. I really wish there's something we can do about it, but in this case, we are at Apple's mercy. We sincerely ask for your understanding. Thank you for using JotForm!